Design trends to watch out for! Seven retail designs that will rule the retail design sector this year. Retail Design is an upcoming and fast growing genre in India, but still not mature enough to match up to retail thinking and design standards of some of the long established retail design companies in the West. Having said that, there is a marked shift in the way the Indian retail industry thinks. From discussing simpler sounding topics like aesthetics, functionality and branding, the industry is abuzz with words like Experiential Retail, Engagement Retail, Smart Retail, Intelligent Retail, Creative Retail, etc. But the most important buzz word to emerge is ROI-linked retail design. We wonder how that happens but surely there are some metrics to take note of. For example, how much average time a customer is spending on the floor and in which section is she spending most of her time? What is her buy rate as compared to the number of dress trials she had and does she seek any service assistance while making her purchase? There are many such questions which are helping strategic retail designers in conceptualising spaces that mean a return on the buck spent. Even though I can confidently conclude that eventually consumer insight-led retail design will emerge as a winner, but trend setters will set the trends and followers will follow them, irrespective of whether it makes commercial sense or not. We list down for you the seven most exciting retail design trends to watch out for in 2012. 2012 will mark the re-entry of bright and colourful spaces as against the dark and dim lit stores aimed at appearing premium. It will also mean a fitting response to an otherwise gloomy economic scenario. In addition to this, we’ll continue to see the new found penchant in urban Indian retail for neat, simple and uncluttered spaces as customers look to deploy retail therapy to de-stress themselves from their busy and hectic schedules. Art has a cultural and symbolic value apart from adding the premium quotient. Brands which have a legacy will look to utilise this strength by introducing art in their stores. 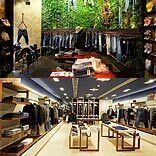 In 2007, Levis created a 34 feet long heritage wall at their flagship store in Bangalore, a visual and virtual walk through a hundred years of Levi's heritage and corresponding world history. With touch-sensor links depicting individual decades from the 1850s to the 2000s, the installation is a virtual scrapbook on Levi's past. This trend of heritage walls will take off in 2012 as brands look at new ways of inspiring consumer imagination. For instance, Giani’s ice cream, the 55 year old Kulfi Faluda brand from Fatehpuri in old Delhi which now has more than 30 outlets in North India, is looking to create a history wall in one of their flagship outlets by a renowned artist, capturing the brand journey. Similarly, use of artefacts and paintings could dominate the design trend in 2012 as compared to conventional graphic design. Energy efficient or environment friendly design will turn out to be a hot way to differentiate as a socially responsible retail business. It will also enhance the brand image of the retailer. Whether it’s energy efficient lighting or usage of recycled materials for making fixtures, green chic design will become the in thing in 2012. Timberland, the international outdoor lifestyle brand is a trendsetter in Green Design. The Timberland stores including the ones in India are specially designed to reflect Timberland's long standing commitment to sustainability through the use of recycled materials and other eco-conscious building practices. This will perhaps be one of the biggest trend shifts for Indian retail design projects in 2012. Most international brands present in India have got their retail design done by specialist retail design companies in the US, Europe and Singapore. Indian retail design companies so far have been used to adapting these designs rather than creating fresh and independent designs. This trend is set to change in 2012 as more home grown and international retail brands look towards Indian retail designers for designing a comprehensive retail identity along with detailed manuals for adaptation. These retail identities will be strongly inspired by the brand philosophy and thought process – a welcome and fresh development in Indian retail given that the industry has been mostly imitating or adapting international designs so far. Theme based design will continue from where it left in 2011 as brands look to reproduce the vintage European or American feel in their stores to connect better with their internationally travelled customers. Brands will look to experiment with looks as diverse as Victorian to neo-classical and Indian ethnic in order to strike a chord. One of the best ways to create a desired brand perception, theme based designs are not new in retail. But they work like no other method, especially when you need to communicate to your audience about the origin or thought process behind the brand. Technology became intrusive in stores in the last three to four years and will become an intrinsic part of trend setting stores in 2012. Whether it is golf simulation in a leading sports store, a large Twitter projection screen in a lifestyle apparel store which publishes your live tweets or ecommerce on touch screens placed inside stores, technology will be increasingly used to create an experiential and engagement oriented retail environment. Some of the new trends in retail technology include interactive touch and sensor screens that display informative videos, side-by-side product comparisons and the ability to purchase products online which may not be available in store stock at that point in time. Intel’s interactive digital signage is an exciting solution in this direction. Or even better, imagine a digital fashion-show wall with a sensational, moving LED display in constantly changing light, movement and energy. Or how about a digital changing room that allows you try and visualise different dresses without actually wearing them. But retail technology will soon move beyond in-store histrionics. Imagine yourself entering a store with your smart phone which has an App that instantly recognises your presence and offers you personalised promotions and suggestive selling. This should perhaps be the defining trend of 2012. Conspicuously absent from the Indian retail scene, high quality and technologically advanced ambient scenting will look to make an entry into Indian stores. However, the real innovation will be in brands wanting to get their own unique signature fragrance created. Studies show that fragrances can have twice as much higher brand recall as compared to visual branding. Imagine the smell of winter fresh eucalyptus and mint in a sports lifestyle store or the Balinese Frangipani for its floral and sensual fragrance in a leading lifestyle SPA chain. Intriguing, isn’t it! Pioneering this trend in the international scene is Abercrombie & Fitch which launched a signature 'woody' aroma—a combination of orange, fir resin, and Brazilian rosewood. Since its roll-out in stores, Abercrombie's Fierce, which also pervades sidewalks outside the clothier's stores, has become an integral part of the shopping experience. Popular demand compelled the brand to produce the trademark odeur in bottle form, and, according to Jovanovic (the perfumer who created the fragrance), customers have complained when store-bought T-shirts lose the smell after multiple washes. The author is Director, Brand Strategy at Strategic Brand Consulting and design company, Brands of Desire.